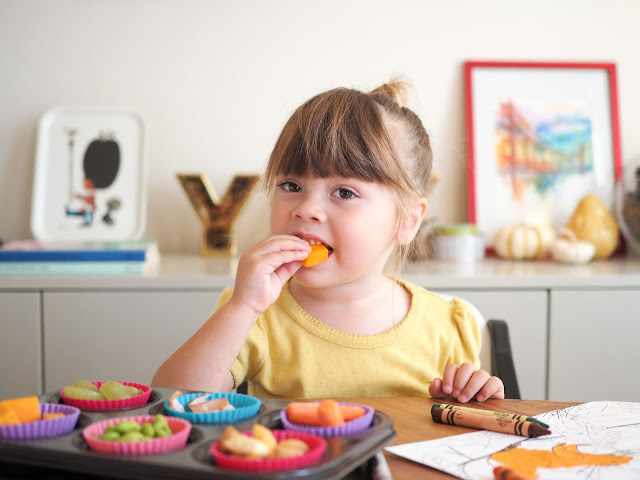 Today I'm sharing with you a super easy way to get toddlers sitting down to eat a range of healthy foods. Mathilde, like most toddlers, can be pretty picky at times about what she eats, and she's not so good when it comes to sitting down for a meal. She's much more of a grazer, snacking throughout the day rather than someone who likes to sit down and eat a big meal. I think that's pretty true of most toddlers - or at least most that I've met! I really don't mind Mathilde snacking throughout the day, especially if she's snacking on something healthy, but I do mind her walking around the apartment with her food. 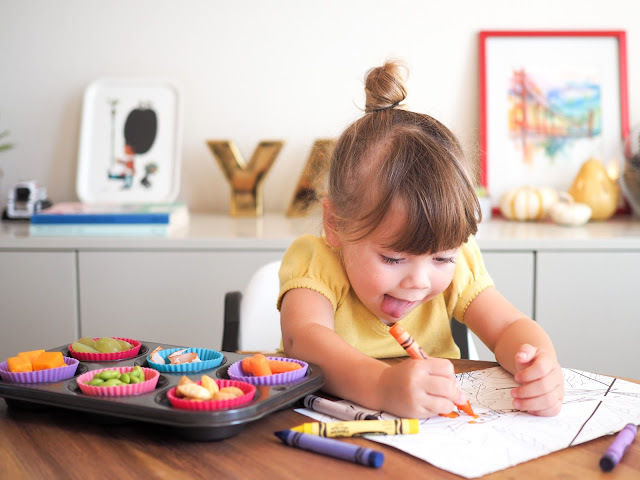 Getting her to sit in one spot can be a little tricky, but I've found a fun way to serve up her snacks that gets her eating in one spot. A muffin tray! 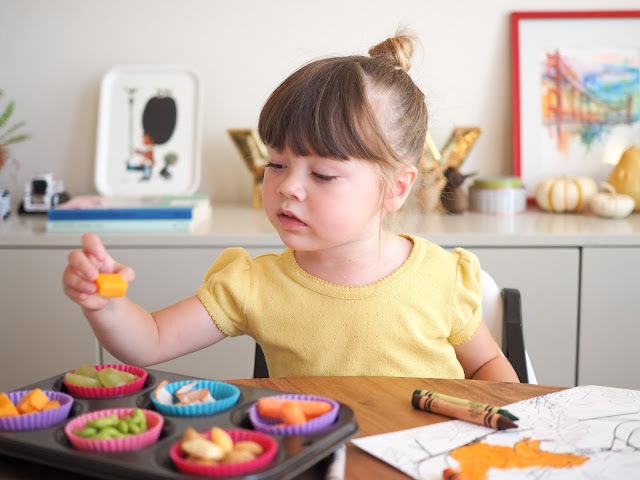 It's such a simple solution, and it's kind of crazy that it works, but if I serve Mathilde's food to her with each item divided into a different part of the muffin tray she's much more likely to sit down and eat it all. If she helps me put it in the muffin tray (and chooses where each item goes) she's even more likely to eat it all. I guess there's just something about toddlers liking things in order - even if they are pretty chaotic most of the time! I like to fill Mathilde's muffin tray with healthy, bite sized pieces of food. It's a great way to make sure that she is eating something from all of the food groups. 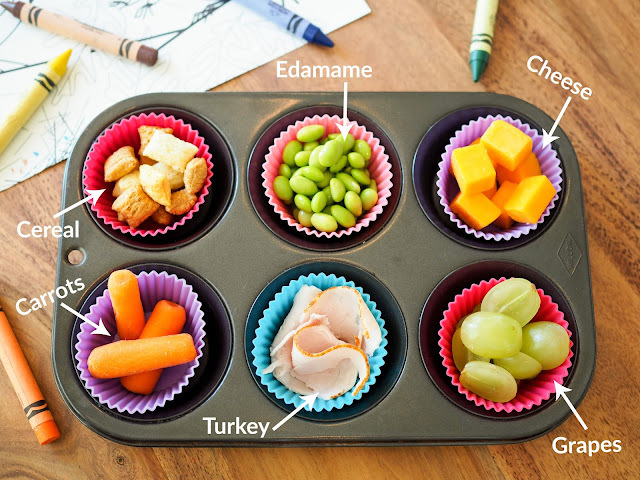 Favorites with Mathilde are grapes (always sliced in half length ways), edamame, black beans, corn, whole grain cereal, carrots, berries, turkey, salami and cheese. 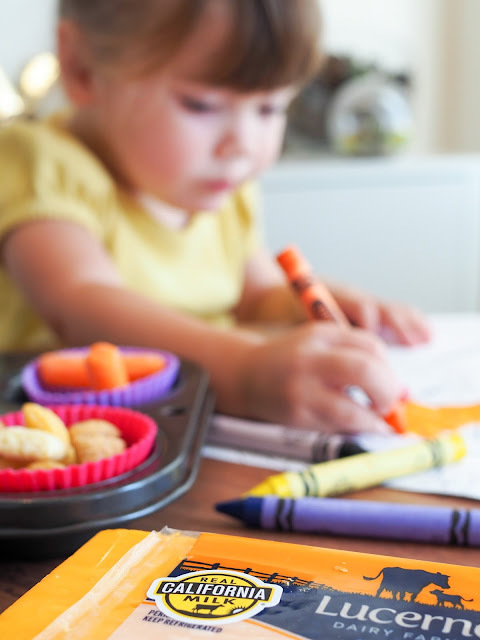 You can add pretty much anything your toddler likes. I like to use silicon cupcake liners in the tray to keep things a little tidier, but you can always skip these and put the food directly in the muffin tray. I like to buy our produce from local growers, and when it comes to the cheese one easy way I know that it's local is to look out for the Real California Milk seal on the pack, like the one in the photo below. This tells me not only is the milk sourced from dairy farms right here in California, but that the farmers have made a commitment to producing quality milk and supporting families and communities. 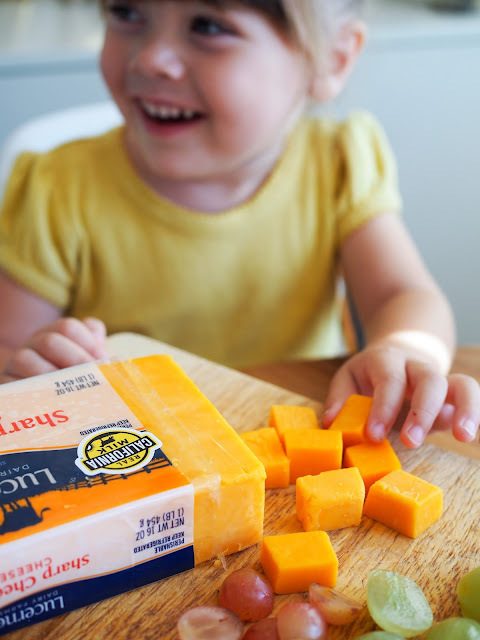 One such way that Real California Milk is supporting families is through the Spot the Seal campaign. Until 12/31/17, Real California Milk will donate $5 to the Great American Milk Drive (up to $20k) every time a customer shares a photo of the Real California Milk seal on social media with the hashtag #SealsForGood. Funds raised will support families affected by hurricanes Harvey and Irma in Texas and Florida. No purchase is necessary. You can find out more about this fantastic campaign here. 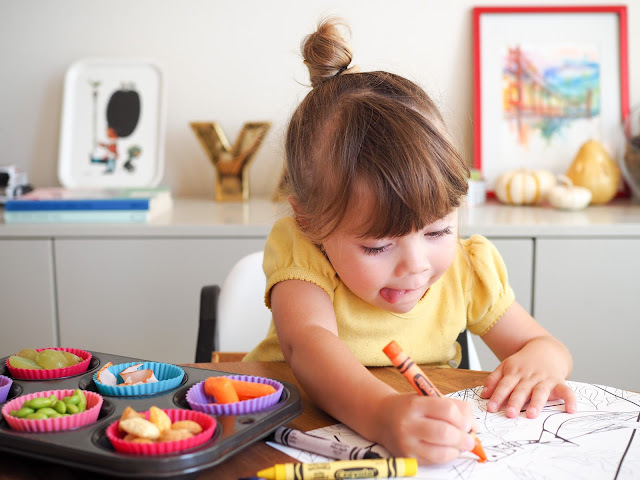 Now, let's get back to that little cutie and her muffin tray of snacks! For more cuteness, check out Mathilde in action with her snack tray in the video below. Don't forget to check out the Spot the Seal campaign. It's such an easy way to help make a difference.